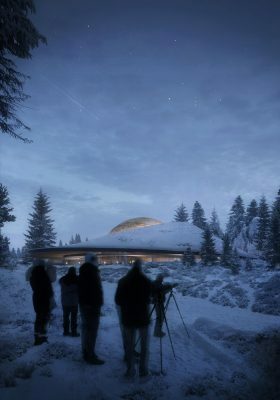 Nestled in the dense forest of Harestua, located 45 kilometers north of Oslo in the municipality of Lunner, Snøhetta has designed a new planetarium and a visitor center for Norway’s largest astronomical facility. 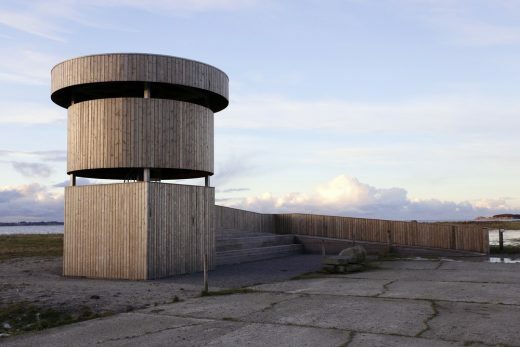 Solobservatoriet is the largest solar observatory North of the Alps, and with its top-notch equipment and elevated site 580 meters above sea level, the expanded facilities will offer guests the opportunity to discover one of Northern Europe’s foremost astronomical research stations. 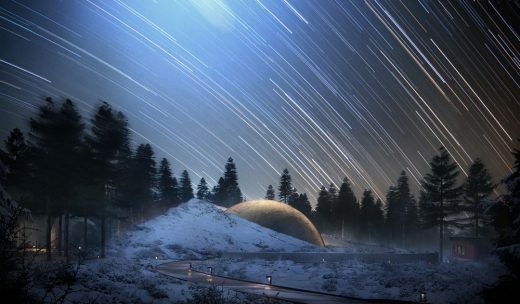 Snøhetta’s design comprises a brand new 1,500 sqm planetarium as well as scattered interstellar cabins, each shaped like a small planet. The new facilities will offer a range of scientific activities within astronomy, sun studies and natural science. Here, researchers, school children, retirees and international tourists can embark on a journey into the world of astronomy and learn more about natural phenomena, such as the Northern lights and the night sky. 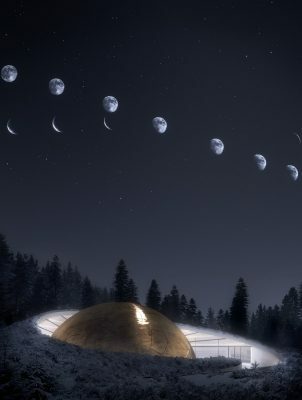 The new visitor’s center is situated near the original solar observatory, a twelve-meter research tower built by the University of Oslo for the total solar eclipse of 1954. More than a decade later, in the late 50’s, Solobservatoriet expanded its facilities though a collaboration with the US Air Force with the introduction of a satellite tracking station that monitored Soviet satellites during the Cold War. From 1986, and until it was sold in 2008, Solobservatoriet served exclusively as a scientific research and information hub administrated by the University. Today, the visitor’s center is owned by the Tycho Brahe Institute, named after the 16th century Danish scientist and founder of modern observational astronomy. The institute collaborates closely with researchers and organizations, providing observations of meteor activity, earthquakes and climatic gasses. 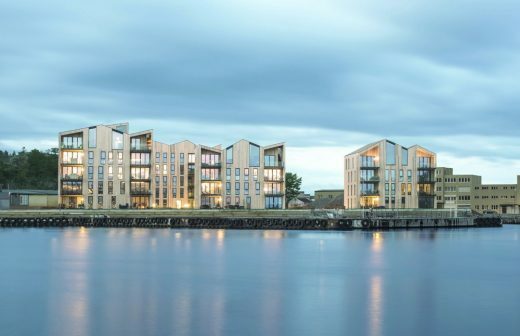 Fulfilling the Institute’s mission to enlighten the public about the wonders of the universe, the new Snøhetta designed astronomical facility is designed to inspire a sense of wonder and curiosity, as if the architecture itself was asking the question: Where does the Universe come from? The Planetarium is the first object that catches the eye when arriving at the facility by foot by trails though the woodland with its grazing sheep. It is a celestial theatre that represents over two millennia of astronomical advance and scientific progress, echoing the world’s very first planetarium which was conceived by Archimedes around 250 B.C. 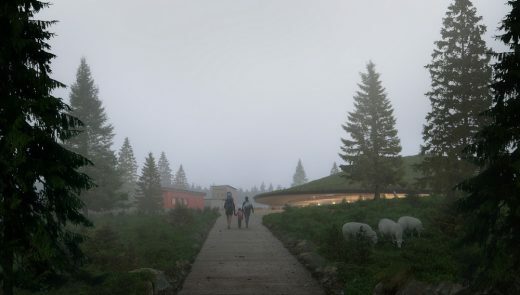 The sinuous roof is lushly planted with grass, wild heather, blueberry and lingonberry bushes, curling up from the ground. 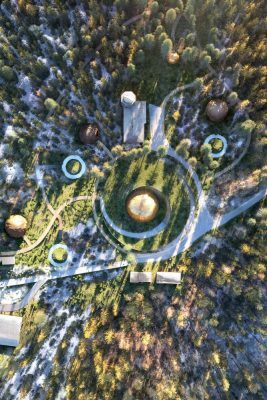 Wrapping around the golden cupola, the living roof functions as a cross between landscape and built structure that visitors can stroll on to gaze up at the starry sky. Half-sunken into the ground, the three-story theater emerges from the earth as an orb engraved with constellations, gradually revealing itself as people approach. 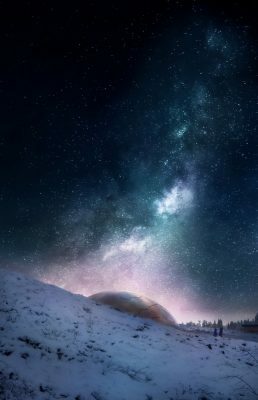 At the Planetarium’s heart, the dome-shaped celestial theatre educates visitors about astronomy and the night sky. The 100-seat theatre allows for a realistic projection of stars, planets and celestial objects. 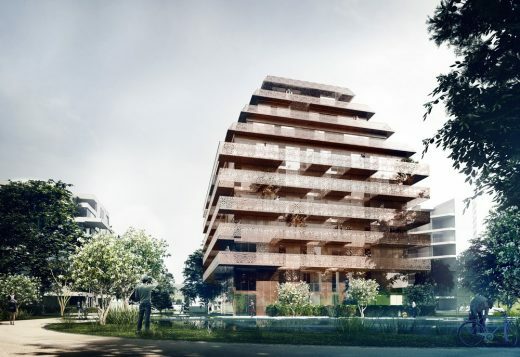 The theater is surrounded by a reception, café and exhibition area and a gently swirling ramp leading up to an exhibition mezzanine and the outdoor roofscape. 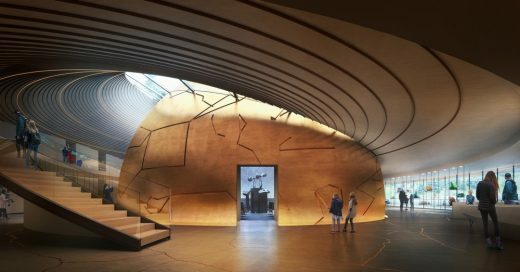 On its lowest level, below ground, the Planetarium dedicates a generous, bowl-shaped space for children to unfold. 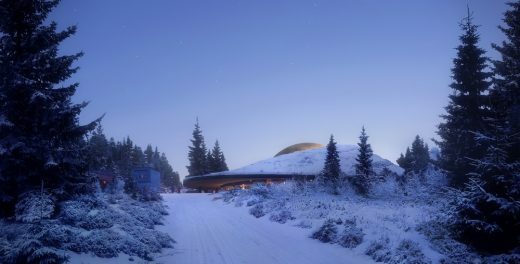 Surrounding the Planetarium are the seven orbiting planets – or interstellar cabins, each with its own unique design. The planets’ surfaces are cladded with rough or smooth materials. While some appear to be halfway driven into the ground, others are gently resting on the soft forest floor, as if they just landed. Rather than small-scale models of real-life planets, the cabins are imaginary objects, each with a specifically assigned name. Six of the planets alternate between 8 and 10 meters in diameter and can accommodate up to 10 and 32 people respectively. The smallest planet, Zolo, is 6 meters in diameter and is composed of a two-bed cabin, allowing for an undisturbed night under the stars. 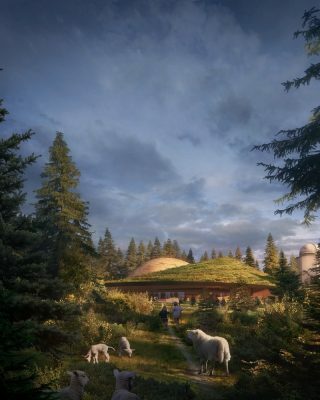 The new Planetarium and cabins represent an ambitious expansion of the current and modest facilities, turning the entire site into a publicly accessible and international knowledge hub while also providing expanded support spaces for activities such as teambuilding, lectures and seminars.